But for some reason, the Washington Post appears determined to perpetuate the myth that, with respect to the nature of Mr. Obama’s FTS political ad campaign, I am wrong. The Post keeps a political ads database, where they list more than 100 titles of campaign ads connected to Barack Obama appearing on t.v., radio, and the web, in years 2007 and 2008. Guess which one is missing? Is there anything you can say that will make the Birthers go away? thus cueing Gibbs to repeat that the electronic image of the COLB mock-up appearing on the paid political ad called “Fight the Smears” really is Obama’s birth certificate, which he – Gibbs – told Obama to post to silence questions as to whether he was “born in this country.” Id. But know what really jumped out at me? Even after Press caught himself, now crediting HI with producing the COLB rather than Obama; and ambiguously using the pronoun “they” to mean either HI or Obama’s campaign; he still acknowledges, this document that was obtained in 2007 was posted on line. (Does he mean to falsely imply that, once the document was obtained (however it was either ‘obtained’ or ‘fabricated’) it was immediately posted?) So, here’s the question I would ask Mr. Press. Anyway, I saw the article on SRA because I was getting hits on my blog from that site and checked it out. Well, I should have guessed, azgo had posted a great comment that included a link to “jbjd.” He agreed I could re-print it here (with my editorial revisions). The “Fight the Smears” web page with the image of a birth document is a paid political advertisement and conforms with TITLE 2 > CHAPTER 14 > of the U.S. Code, § 441d. Publication and distribution of statements and solicitations. This section deals with campaign funding, reporting, and other parameters. Nothing in this law requires the advertising content to be true. And that only makes sense. 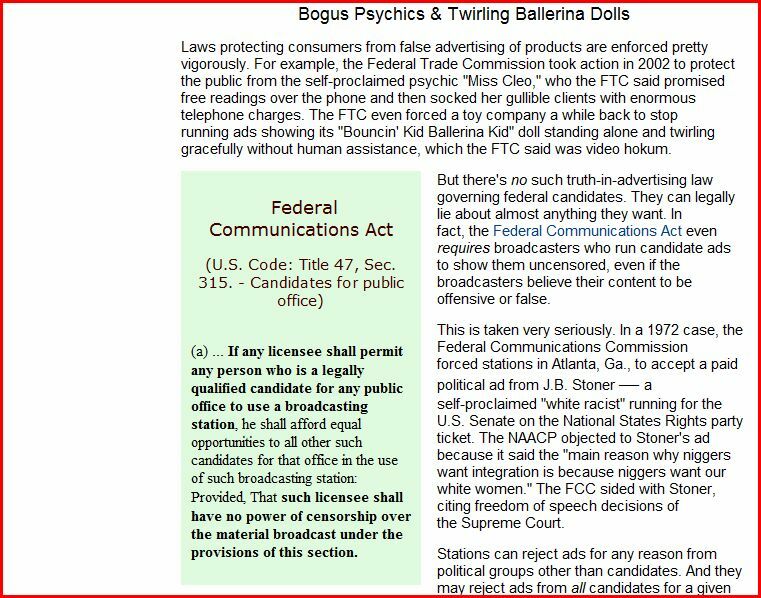 Because as the Supreme Court has ruled, when it comes to the First Amendment right to freedom of speech, political advertising is legal even if the advertiser does not tell the truth. “…the general rule is that the speaker and the audience, not the government, assess the value of the information presented.” Edenfield v. Fane (91-1594), 507 U.S. 761 (1993). The Obama campaign threw up an eye-catching wizardry of a political advertisement they named, “Fight the Smears,” on which they displayed graphics for visual impact, and ad copy with terms of art like ‘native born’ and ‘citizenship conferred by the 14th Amendment’ cleverly conflating these terms with the one they never mentioned, “natural born.” But this is the term emblazoned in Article II, section 1 of the Constitution. And, consistent with section 441d, they solicited the public to ‘donate now’ and tell others, all so as to spread their truth about the candidate. Even though it was all a lie. In truth, the state of Hawaii has never claimed responsibility as the “issuing authority” – this term of art is defined right there in the Code – of that online image of a COLB on the advertising platform entitled FTS. They never confirmed this was a genuine “identification document,” consistent with the Code. Even the ad failed to claim, this ‘document’ came from the HI Department of Health, Vital Records. Or to include any identifying information that would allow anyone to trace back the mock-up to its hinted origins. And all of the venues reporting that, having seen the image, they could confirm its authenticity – L.A. Times, Daily Kos, Annenberg Political FactCheck, Politifact – also stated publicly, they had received this image directly from the Obama campaign. …except that many Americans, including not just the media but worse, our state and national public officials can be duped into believing an image is real which was only created as the focal point of an on-line political advertising campaign to combat rumors a Presidential candidate is Constitutionally ineligible for the job! 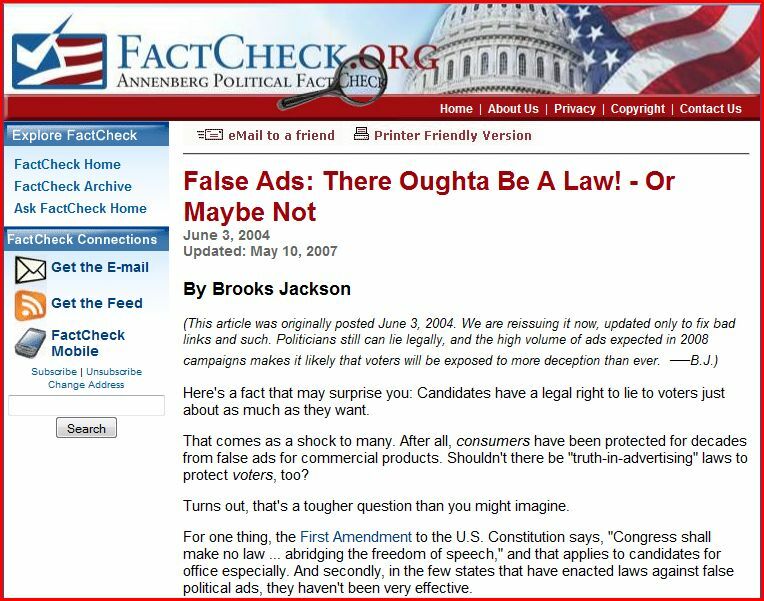 Not surprisingly, in 2007, gearing up for the political campaign of Barack Obama, the circumstances of whose birth, if uncovered, they believed would derail his bid to lead the free world; APFC posted this homage to the First Amendment license to print paid political lies. 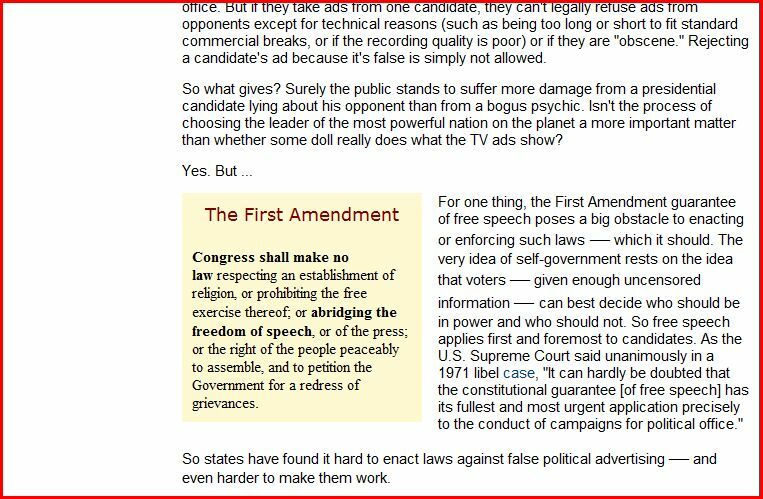 Seems to me, a sitting U.S. Representative who is a candidate for U.S. Senate should be at least as well informed about the difference between protected false speech in paid political advertising, and the truth; as ordinary citizens who collaborated via email in their spare time to put together this post on a blog.